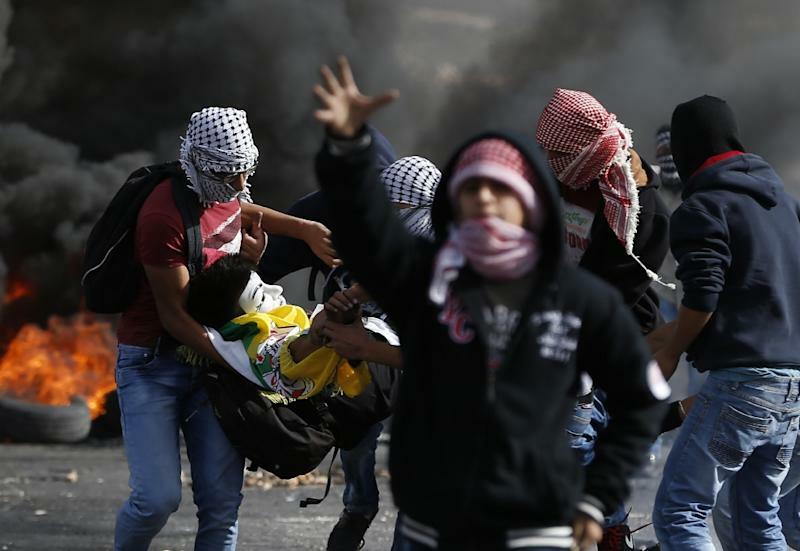 Ramallah (Palestinian Territories) (AFP) - Dozens of Palestinians were injured during clashes with Israeli forces in the West Bank Wednesday, the anniversary of the death of their leader, Yasser Arafat, the Palestinian health ministry said. 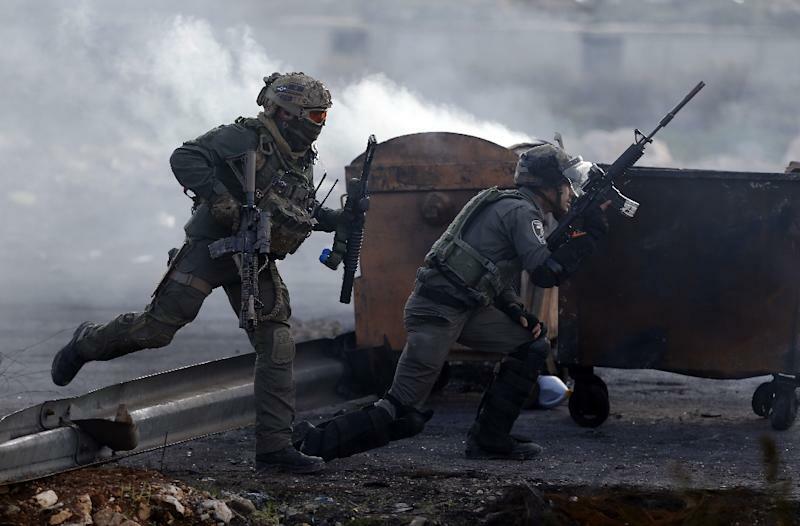 At least four people were wounded by live ammunition in Al-Bireh, near Ramallah, the ministry said, adding that doctors were operating to try to save the life of one person shot in the heart. Another six Palestinians were hit with live ammunition in clashes in the city of Tulkarem, north of Tel Aviv. 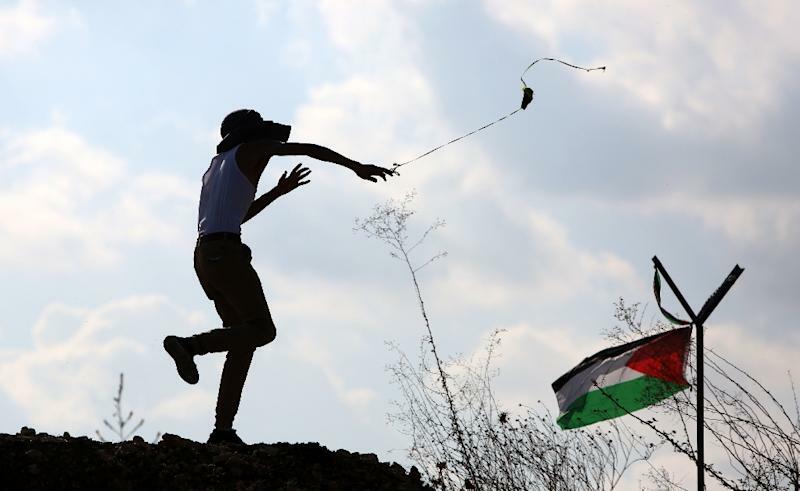 In total, "62 citizens were injured by live ammunition and rubber-coated bullets during clashes with the (Israeli) occupation in Tulkarem, Ramallah, Al-Bireh and Bethlehem." The Israeli army said its forces had responded to attacks. "Rioters attacked forces and hurled Molotov cocktails and rocks at them. The forces then responded," including with live fire, the statement said. Between 200 and 300 Palestinians, flanked by a yellow truck playing nationalist songs, marched towards Israeli forces in Al-Bireh, with youths throwing stones and rolling burning tires towards security forces. Those forces fired tear gas and live ammunition at the crowds in a bid to disperse them, an AFP correspondent reported. In Gaza City, around 2,000 Palestinian protested outside the offices of the United Nations, with many holding signs venerating Arafat. There were no reports of violence . Wednesday's protests came amid a weeks-long wave of violence, including gun, knife and car-ramming attacks by Palestinians. The violence has claimed the lives of at least 77 people on the Palestinian side -- one of them an Israeli Arab -- along with 10 Israelis. Many of the Palestinians killed were alleged attackers. The long-time Palestinian leader, aged 75, died in 2004 at a military hospital near Paris after developing stomach pains while at his headquarters in Ramallah. Palestinian officials have repeatedly pointed the finger at Israel for his death, with accusations of polonium poisoning. Israel has always denied the claims. Palestinian president Mahmud Abbas said a commission of inquiry investigating Arafat's death has “come a long way” but was not yet ready to release a final report. In a wide-ranging speech, he again stressed his commitment to a unity government between his Fatah party and Hamas, the Islamist movement that controls the Gaza Strip. They formed one last year but it never really got off the ground before it fell apart. On Tuesday, Hamas handed over Arafat’s Gaza residence to the Palestine Liberation Organisation in what they described as a conciliatory gesture. Abbas said both movements were determined "to work together to form a national unity government based on the programme of the Palestine Liberation Organization, to organise elections and to convene a national Palestinian council."